This entry was posted on December 11, 2015 by Jessica Anderson. 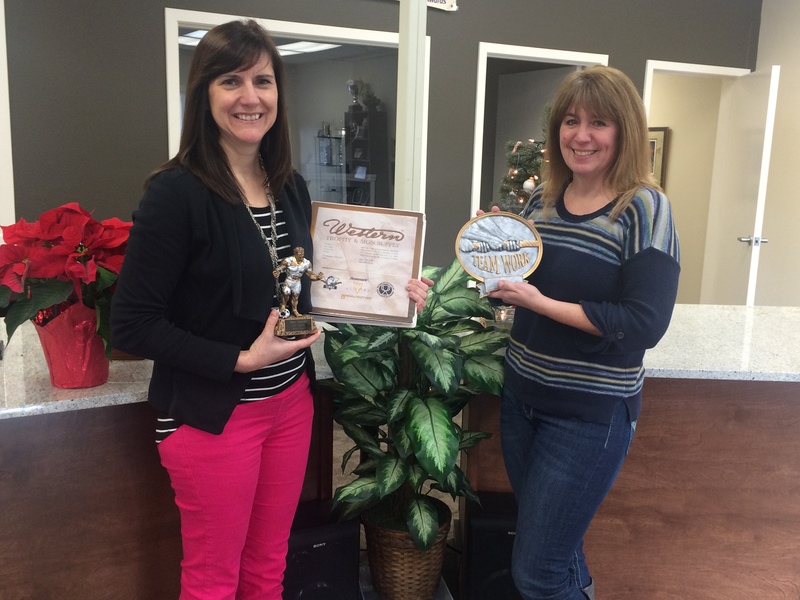 Margene and I model two of the trophies we carry from Western along with their wholesale catalog. That's what sets apart our 2015 "Vendor of the Year", Western Trophy & Sign Supply. With locations in OR, CA, AZ, and CO, this wholesale awards distributor provides many trophy components to awards companies across the western US. Western Trophy was nominated for "Vendor of the Year" by both our President, Jeff and our Production Manager, Tom. Jeff said: "Western has great products and amazing customer service". Tom said: "I nominated Western because of their great customer service team. Dan, Kathy, Chris, Brenda, Rod, John, and Megan are always very helpful, knowledgeable, personable, and dependable. When there are problems, such as product shortages, they always work with me to figure out alternatives. They also patiently accommodate me when my order needs additions or changes." Western is a main distributor of Plastic Dress Up (PDU) products, which are the main components of most of our sports trophies. We also purchase many resin awards and medals from Western. We work mostly with the staff in the Portland, OR warehouse, as that is the location closest to our production facility in Renton, WA. Just one shipping day away, Western helps us fulfill customer orders quickly and efficiently. Congratulations to Western Trophy for being our supplier of the year! Thank you for supplying us with quality products and for the great customer service you give to Trophies2Go every day.